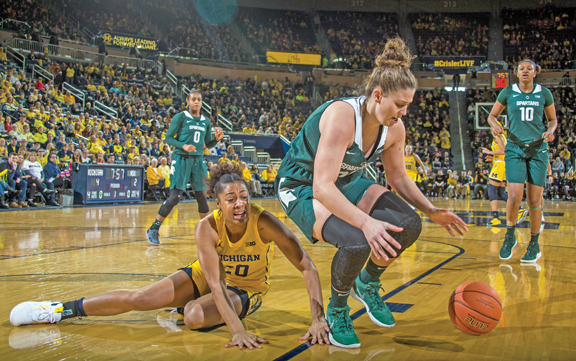 ANN ARBOR — Michigan State guard Taryn McCutcheon was the shortest player on the court and proved height is just a number. The 5-foot-5 McCutcheon had 14 points, six assists, four rebounds and two steals to help the 23rd-ranked Spartans hold off Michigan for a 77-73 victory Sunday. Even the Wolverines were impressed by the diminutive and dynamic player. “I have a 5-foot-3 daughter and her dream is to play for me someday so when I see McCutcheon out there, it puts a smile on my face,” Michigan coach Kim Barnes Arico said. The junior from East Lansing is happy to be looked up to. “I’m glad I can do that for people because there’s been a million people tell me I’m too small to play where I’m playing,” McCutcheon said. McCutcheon, who makes 44 percent of her shots beyond the arc to rank among the nation’s leaders, was 4 of 8 on 3-pointers against Michigan.